Last season on Real Housewives of New York, Dorinda Medley dressed up as Lady Gaga for Halloween. Now she wants Lady Gaga on the show for real, well potentially, but just not as a Real Housewife. 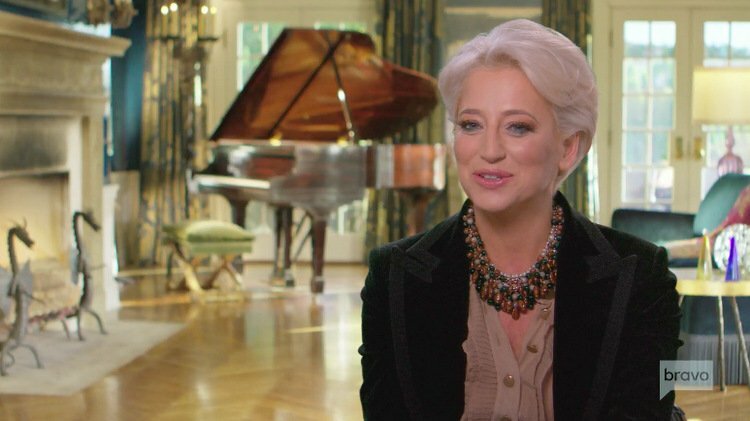 Dorinda actually thinks Lady Gaga’s mom, Cynthia Germanotta, would make a great New York Housewife. Are you listening, Andy Cohen? This means that Lady Gaga could join Avery Singer as one of the Real Housewife daughters dispensing sage advice to the “adults” in the cast. It sounds like a great idea to me. Thanks to a last-minute cancellation… Brandi Glanville did nothing but talk to herself (and two of her super fans) on her podcast, Brandi Glanville Unfiltered, earlier this week. Honestly, I barely noticed the absence of a guest since Brandi never lets them speak anyway. Several Bravo stars invaded Las Vegas this past weekend. First Real Housewives of Orange County‘s Shannon Beador and Flipping Out‘s Jenni Pulos showed up to support Heather McDonald in her stand-up show at the Venetian. Then Real Housewives of Beverly Hills star Kyle Richards, Vicki Gunvalson, Real Housewives of New Jersey‘s Melissa Gorga, and Real Housewives of Atlanta’s Kenya Moore participated in an event at Caesars Palace. The event at Caesars Palace paired each of the housewives with a high roller from the casino for silly games. One game was walking on a runway. Of course, Kenya‘s no stranger to a runway, but she got ahead of herself and took a major spill. There are no words to describe what she did next! See video of Kenya’s fall and snapshots of the Bravolebrities below. She begins her Bravo blog, "Hola Mis Amores! First of all: THANK YOU!!!! Thank you so much for voting for me as the Loveliest Locks. It was very sweet, and I'm so honored to have been chosen by all of you — as I do think all the ladies have amazing hair, especially my friend Kyle [Richards]. Your love and support through this journey has made everything worth it. In this portion of the reunion…"
Is Lady Gaga Featuring The Cast Of Real Housewives Of Beverly Hills In Her Latest Music Video? Is this what we're calling avant-garde these days? Lady Gaga fancies herself to be on the experimental edge of pop culture and pop music (and having been to one of her concerts, I'd say men dressed in condoms and burning statutes crying blood aren't your typical pop fan fare), and now she's pushing the envelope even more. That's right. Gaga is supposedly featuring the Real Housewives of Beverly Hills in an upcoming video. Perhaps she's more mainstream than she'd like to admit. You know Kyle Richards' is having a field day over this! I can only imagine the title of this song!